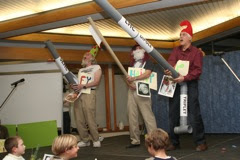 Since always, the TH Christmas play has marked the end of the year at CERN. Typically, the script comments on the important events of the year. The audience loves the show for Pythonesque humor, ruthless satire and explicit content. Previous plays created undeniable stars: Georg Weiglein has been known as Shrek ever since, while Ben Allanach's Borat is legendary, especially among the female part of CERN staff. The late DG, after seeing the play in his honour the other day, ended up convinced that the Theory Group is expendable and cut down on our budget. The remaining candidates are downgraded to uncandidates, despite violent protests from Snow Pauss' supporters. The chosen three face each other in a three-man standoff a-la The Good, the Bad and the Ugly. In the original movie, the Good shoots the Bad, while Ugly finds his gun unloaded. This time, however, "Roby" the Ugly shoots "Hairy" the Good at the back, thus proving that real life is different than movies. More photos here and here. The uncensored video recording can be downloaded from here.